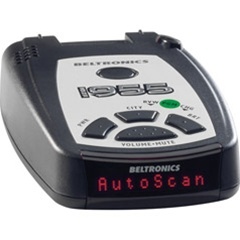 Please note that the V-955 has been discontinued and was replaced by the Beltronics Pro 200 radar detector. Why Buy a Beltronics Detector? Performance! Beltronics is the industry leader in technology and innovation. Our all-new varactor-tuned microwave receiver delivers the longest possible warning on all radar bands. 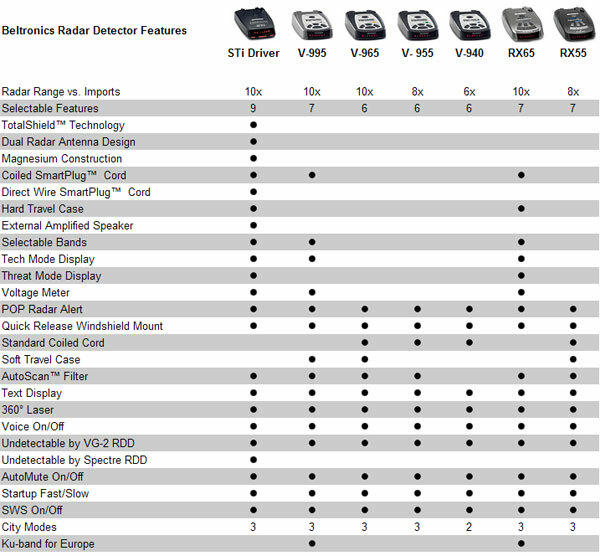 In fact, Vector 955 provides 8 times the sensitivity of any imported radar detector (Korea, Philippines, China, etc. ), and it's made right here in North America. Vector 955's lightning fast microprocessor can detect and process a signal in less than one second! This "attack time" is crucial against laser and instant-on radar. Beltronics' patented AutoScan feature continuously analyzes all incoming signals and automatically rejects unwanted false alarms. This gives you, the driver, the perfect balance of sensitivity and selectivity! Our Total Tracking Laser circuitry continually searches for laser guns. Maximum range, including superior off-axis protection, is standard. Vector 955 is simple to own and operate. Preset at the factory, Vector 955 is optimized for highway driving. Or, customize the Vector 955 to meet your specific driving style. The easy-to-use selectable options make it simple to change. Easy to understand digital voice alerts let you keep your eyes on the road. Or program unique audio tones for X, K, Ka, Laser and SWS. Vector 955 has four levels of brightness to choose from, including full dark mode for discreet night travel. Exclusive Shadow Technology keeps you unseen by Interceptor VG2 (radar detector detector). Choose from two levels of City mode filters, including Low X and No X for quiet operation in town. Vector 955's AutoMute feature automatically reduces the volume level during an alert. Or, simply press the large top-mounted Mute button during an alert to instantly quiet the audio. Using a high-bright alphanumeric display, the Vector 955 is easy to read from any angle. Standard bar graph display provides band and relative signal strength for radar and laser signals. Vector 955 comes complete with a comprehensive owner's manual with quick reference card, quick-release windshield mount, and high-performance coiled power cord.